This was our first time making farro, and thought 'hiding' it in a stuffed pepper would be a top notch idea! 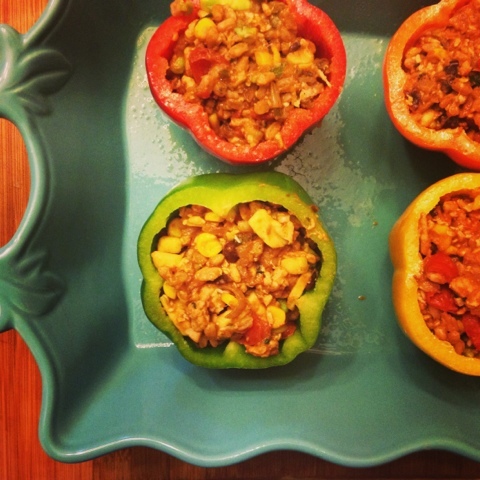 We decided on an Avocado and Farro Stuffed Pepper and they were absolutely delish! A little bit about farro: It honestly tastes like brown rice, just a little nuttier and more plump! Here's the good news, farro is a protein and fiber packed grain. Farro is also believed to stimulate your immune system, lower cholesterol and maintain blood sugar! Why wouldn't you eat this? Back to our delicious peppers... we stuffed them with lean ground turkey, farro, black beans, corn, jalapeno, onion, tomatoes, garlic and fresh cilantro. We topped our peppers with reduced fat Mexican cheese and baked them to golden perfection! 3. While peppers are cooking spray skillet with non-stick spray. Add onions, garlic, jalapeno, cumin and ground turkey. Cook for 3-5 minutes or until meat is cooked through. 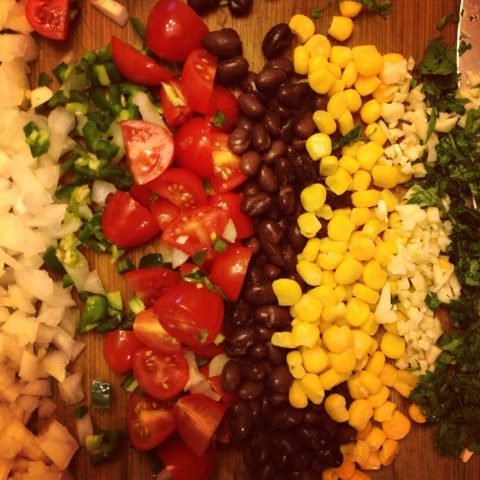 Add black beans, corn, tomatoes, and juice and zest from lime. 4. Once farro is cooked, add farro, avocado and 2 tbsp. Mexican cheese to skillet. 5. Fill pre-cooked peppers with mixture. Cover dish with aluminum foil and bake for 20 minutes. mmm cheesy bean stuffed peppers sounds delish!